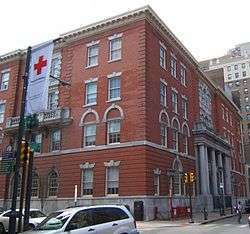 The Historical Society of Pennsylvania is a historical society founded in 1824 and based in Philadelphia. The Society's building, designed by Addison Hutton and listed on Philadelphia's Register of Historical Places, houses some 600,000 printed items and over 19 million manuscript and graphic items. The Society maintains printed collections on Pennsylvania and regional history and manuscript collections covering 17th-, 18th-, and 19th-century history. The holdings of the Balch Institute for Ethnic Studies were added in 2002 and those of the Genealogical Society of Pennsylvania in 2006. The Historical Society has recently undertaken efforts to appeal to a younger demographic, including having open bar events. The society's building on the southwest corner of 13th and Locust Streets was formerly the site of the Patterson Mansion. General Robert Patterson, a general of the Mexican-American and Civil Wars purchased the mansion from John Hare Powell, the founder of the Pennsylvania Agricultural Society. After Patterson’s death in 1881, the Historical Society of Pennsylvania purchased the mansion as its permanent home. The mansion was demolished between 1905 and 1909 and the main block of a new fireproof building, again designed by Addison Hutton, was constructed on site. The totally fireproof building was dedicated in 1910. Books and pamphlets: ranging from limited-edition and out-of-print volumes to current reference works and scholarly monographs. The Society’s pre-1820 imprints are housed next door at The Library Company of Philadelphia. Serials and newspapers: spanning almost 300 years, in either original format or microfilm copy. Manuscripts: materials such as letters, diaries, account books, deeds, minutes, and scrapbooks. Manuscript collections include personal papers created by individuals and families, and records created by organizations and businesses. Graphics: prints, watercolors, and other works of art on paper, architectural drawings, photographs, broadsides, maps, posters, and other images. Printed ephemera: such as event programs, brochures, invitations, advertisements, trade cards, certificates, and menus. Microforms: microfilm and microfiche reproductions of newspapers, genealogical resources, manuscript collections, and other materials. To help researchers find the materials they need, all of these resources are available through the "Online Catalogs and Research Tools" of the society's web site. The society publishes Sidelights, a semi-annual newsletter, Pennsylvania Legacies, a semi-annual illustrated history magazine, and the Pennsylvania Magazine of History and Biography, a quarterly scholarly journal published since 1877. In May 2016, a play by Ain Gordon, 217 Boxes of Dr. Henry Anonymous – based on Gordon's research as an "embedded artist" at the Historical Society of Pennsylvania, where Dr. John E. Fryer's papers are archived – premiered at the Painted Bride Art Center in Philadelphia. The play explores Fryer and the circumstances around his disguised appearance at the American Psychiatric Association's 1972 convention in Dallas as "Dr. Henry Anonymous" in a debate called "Psychiatry: Friend or Foe to the Homosexual?" in a successful attempt to have homosexuality removed from the APA's Diagnostic and Statistical Manual of Mental Disorders, where it was listed as a mental disease. The play uses monologues by three people who knew him: Alfred A. Gross, the New York-based head of the George W. Henry Foundation, a social charity which helped homosexual men who had gotten into trouble with the law; Katherine Luder, Fryer's long-time secretary; and Fryer's father, Ercel Ray Fryer. ↑ Loeb, Pat (December 3, 2009). "Pa. Historical Society Wooing A Younger Crowd". KYW. Philadelphia. ↑ "Online Catalogs & Research Tools : Historical Society of Pennsylvania". Retrieved 2010-02-06. The Historical Society of Pennsylvania with The Balch Institute for Ethnic Studies, Institutional Records 1824–2005, documenting the governance and activities of these two organizations throughout their institutional histories, are available for research use at the Historical Society of Pennsylvania.